The Hampshire building caught fire once before. The urban legend was that many guests died and their souls haunted the hotel. If you believe that crap you may be interested in a bridge available for sale. In actuality it was a textbook example in insurance fraud. The year was 1996. Neil's Mazel had just agreed to buy the hotel. During the change of ownership, Neil's Mazel took out a significant insurance policy on the hotel. 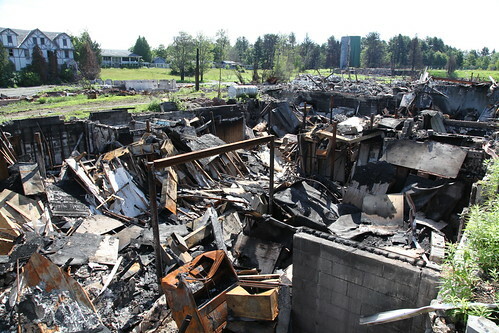 The Hampshire building burned less than a week later and while the proceeds from the insurance claim were paid in full, the building was never rebuilt. Instead the basement was salvaged - a new roof was built over the basement at ground level, allowing the basement to remain in use as a "health spa" and locker rooms for the nearby indoor pool. the best, in a very cynical way, is that neils mazel had not even closed on the property but got enough from the fire to cover the down payment/ a large portion of price of the property, which he was buying form the county for back taxes.